Hello Dr. Janine Krause here. Today I’m going to talk about do carbohydrates cause you to have more gas? It’s one of the common questions I get from my patients and this is usually a question that leads up to do I have non-beneficial bacterial in my gut producing all this gas? So let’s take a step back for a second do carbohydrates cause gas? Well yes, of course. They absolutely can. Why, because beneficial bacteria that break down those carbohydrates produce methane. They produce carbon dioxide and they produce hydrogen among other things, while their fermenting carbohydrates so while they’re breaking it down. So in previous videos I’ve talked a lot about how it’s so important that you chew your food. Why, because the more you chew, the less gas that’s gonna be produced in the fermentation process by these beneficial bacteria. Why, because if you give them a smaller piece to work with they don’t have to cause this big inflammatory bloating process and so that’s one thing you can do. Now in terms of gas and the formation of gas, the folks who are less gassy have more beneficial bacteria that can handle all of the carbohydrates that they eat. 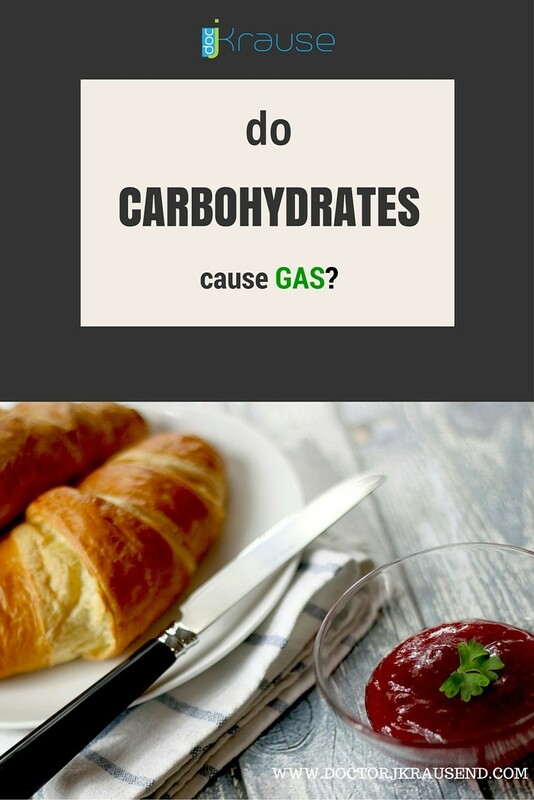 Those that have more gas have less of the proper beneficial bacteria to break down these carbohydrates. So how do you fix this? Well, one way can go about it is to take probiotics that you can’t just go ahead and jump in and take probiotics on their own. You want to give them a little bit of food something called a prebiotic which is basically fuel for them. It comes in the form of apples, green bananas, plantains, coconut flour, cold potatoes, all those different things could be used as fuel for your probiotics. So essentially when you’re taking a probiotic capsule. You want to pair it with a tablespoon or two of say a cold potato. You boil the potato up for 5 to 6 minutes. You put it on the ice bed to stop the cooking process. Then take it out and take the little tiny potato fingerling works good for this. You can take that with your probiotic. Now you’ve given your probiotic a little fuel and food for the trip and so what you doing there is training your body to be able to tolerate that beneficial bacteria and to be able to give it some fuel so they can proliferate. Basically set up its neighborhoods and families or whatever you want to call it in the digestive system. So let’s go back to why would we want to eat carbohydrates, because they’ve kind of been demonized lately with Paleo diets and what not. Well, folks who are on the paleo, I’ve done it myself before on and off and I’ll be honest, yes, you do have less gas. Why, because you’re not consuming the carbohydrates that you would have normally consumed and now the bacteria aren’t dealing with carbohydrates they are dealing with proteins and fats. So yes the paleo diet will definitely decrease your amount of gas but what you’re missing out on are some of the really great benefits of the bacteria can produce for you when they’re fermenting your food. Why, because beneficial bacteria can make something called butyrate. Butyrate can come from the breakdown of carbohydrates. Butyrate is rate fuel for that digestive system lining. It strengthens it up. So if you’ve ever heard of anyone using the term leaky gut, intestinal permeability, that separating of that intestinal lining, you can help to strengthen your digestive system and immune system if you are eating a little bit of carbohydrates and of course you’ve got to choose your carbohydrates wisely. I’m not talking about going and getting a box of hoho’s or dingdong’s. I’m talking about whole grains and things of that nature. So one of the big things I find with a lot of my patients when they’re on the paleo diet is they’re like yes sausage, yes meat, but they forget about the veggies and those veggies are there for a purpose and we need veggies. Why? Those guys are great fuel for the digestive system lining. In future videos I will talk a little bit more in depth about that but since our topic is more on gas and bloating today, I wanted to basically put it out there that carbs are not the enemy. It’s just really how much and if your body is ready to be able to tolerate them. So I have a lot of people who can’t digest veggies. Why? They get on this healthy diet this juice diet they get the veggies than their oh my gosh I have so much gas, because they don’t have enough of the beneficial bacteria and so if you want to cut down on the amount of gas in your digestive system but you do want to eat carbohydrates the most important thing to do is get yourself started on probiotics go slow start with about 5 billion organisms a day and take it with a little bit of prebiotic so that’s that little bit of potato starch a little bit of plantain or something of that nature and so start with that and then train yourself to be able to digest carbohydrates better and you have a lot less gas and don’t forget to chew. I’m Dr. Janine Krause and thanks for watching!